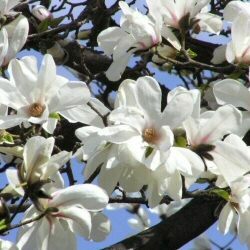 A named variety of magnolia stellata, Royal Star is a strikingly beautiful tree because of its enchanting, delicately fragranted, snow white flowers , which have a slight pink hue and resemble large daisies. This particular magnolia is a small tree, with a height of 3m (10ft), so is ideal for planting on the patio in either a large container or planted in a small garden. Its leaves are a mid to light green colour and the tree is distinguished by its silky-type buds which once open reveal the flowers. In common with some trees, its flowers open prior to leaf opening and remain on the tree for a few weeks. Our Magnolia trees are supplied at a height of between 0.80-1.20cm n a 7-15 L container, which means that the tree has a well-established root system and can be planted any time of the year and with better results than either bare-root or rootballed trees. If it is important to you that you have a Magnolia Stellata tree or a bush then please email us before purchase to check which you would receive.